What’s so special about avocado salad recipes? I’ll tell you in this post! 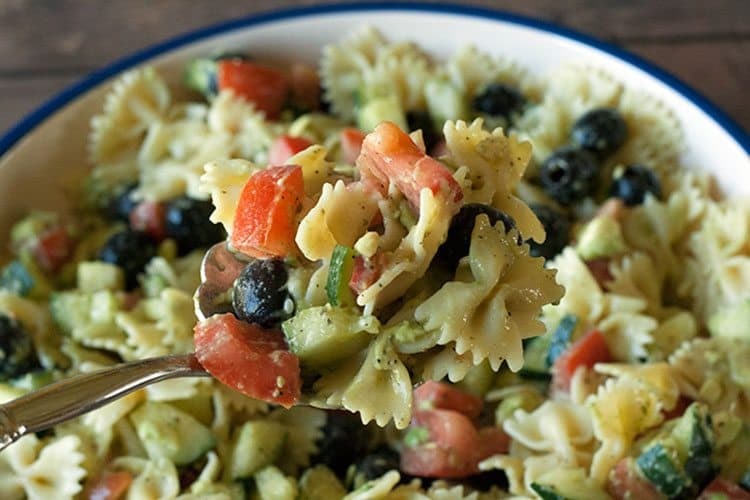 Plus, I share a refreshing avocado salad recipe: Pasta Avocado Salad. Avocado salad recipes are like none other. There is just something about that green superfood that is an avocado that can make any recipe more spectacular. If you like avocados, you probably already enjoy guacamole. Aside from the soup, salad and appetizer route, one of my favorite dinners to pair up with some sliced avocado is Chicken Enchilada Casserole. So, you get the idea — quick avocado recipes (including avocado salad recipes) are second to none. 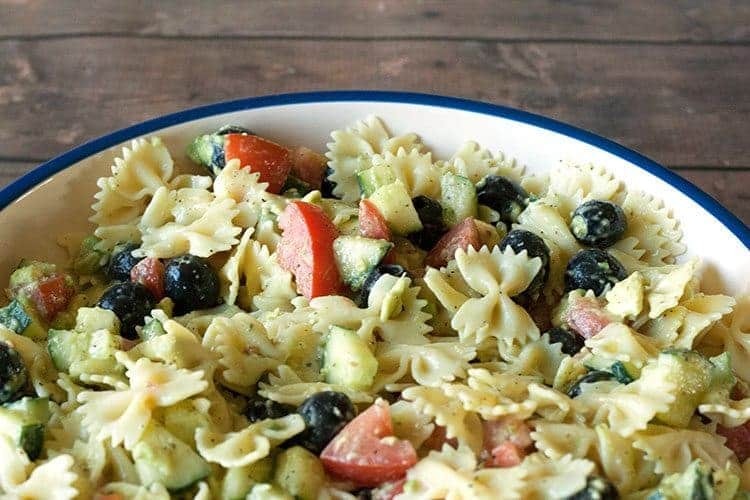 That’s why I like to toss avocados into recipes you might not normally think of them being in… like a turning a pasta salad recipe into an avocado salad recipe. It works, right? 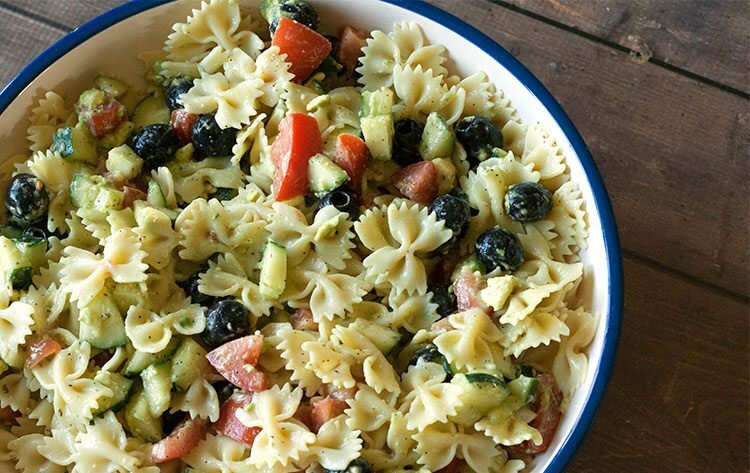 Besides being a spoonful of gorgeous, tasty delight, our Pasta Avocado Salad Recipe takes a wonderful photo. And when it looks so good, and tastes so good…it’s just right. For this recipe we mixed together bowtie past, black olives, chopped cucumbers and tomatoes; and then mashed up some avocado along with a splash of olive oil, salt and pepper and stirred it all together. 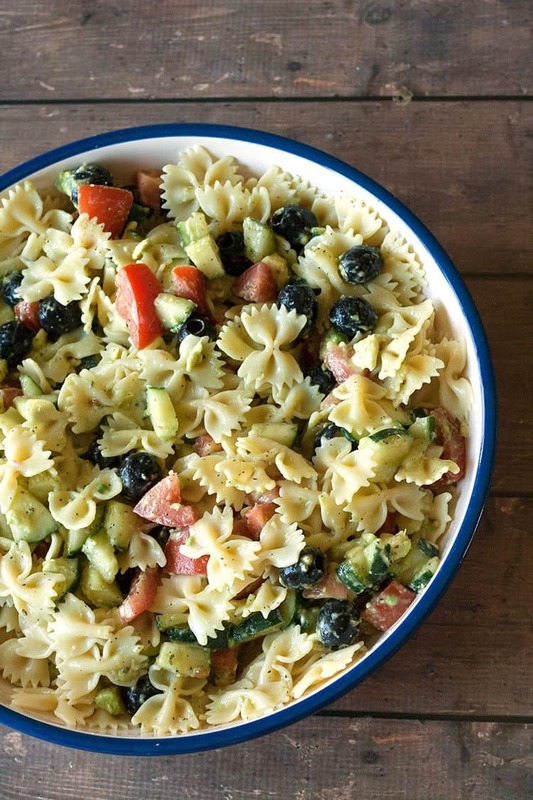 The result was a perfectly scrumptious pasta salad perfect for potlucks, a main dish or a side. So, confession time. In between all the cooking and food staging I do for All She Cooks, and my son leaving dishes in his room all the time — somehow, our house has been devouring our spoons. Like the washing machine sock monster, but this time it’s happening in the kitchen! I’m not sure if they’ve accidentally been thrown away over time or what… but its come to the inevitable conclusion of having to invest (once again) in a good set of silverware. Because who wants to not have a complete set of silverware. It pains me, because well — where did the spoons go? But, whatever the case, I have my eye on this set of flatware that I think would look amazing in food photos (especially the next avocado salad recipes I whip up!). Not to mention on a set table, right? And to think, it all started with an amazing Avocado Salad Recipe! Delish, brain power and lots of innovative business-growing motivation. Love it! Hope you enjoy this avocado salad recipe as much as we did. This healthy avocado salad recipe is easy to make and full of flavor! Rinse prepared pasta with cold water. Drain. Add to salad bowl. Add those three ingredients to salad bowl with pasta. Mash avocado and mix together with splash of olive oil and salt and pepper to taste.